Lennie has been attending what I thought were JOGT meetings on a regular basis. I googled and googled and could not find reference to JOGT. I knew it had something to do with a lodge or fraternal organization but was puzzled that I could not find any information online. Then I realized Lennie was writing IOGT and not JOGT. Lennie's IOGT could have been the International Organisation of Good Templars that was devoted to and encouraged sobriety. Children's day had exercises at church. Started to haul manure for Green. Did not play in band. Hauled loads. Went down and watched the soldiers tonight. Went down and watched Co. G drill. Went to bed at 7:30. Rev. Giffen came back with his wife. Lennie's job of hauling manure could not have been a pleasant one. But it was a necessary farm activity. 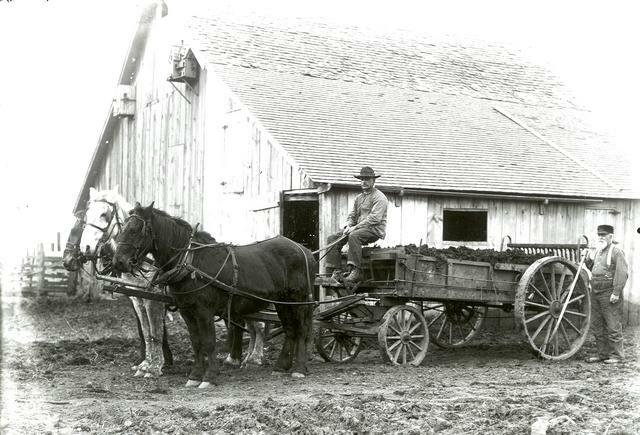 Each spring the pens and barns would be cleaned of manure...usually by hand using a pitchfork. The smelly stuff would be tossed into a manure spreading wagon and hauled out to the fields. A mechanism on the back of the wagon spread the manure evenly over the field. You can read more about that process here. This photo is from the Illinois State Museum Collection. Ah... that's one mystery solved. I do like that kilt, too, no matter why he's wearing it.